Riding uphill on a Boosted Board feels like you’re cheating gravity. Today this powerful, easy-to-control electric skateboard debuts on Kickstarter, and after riding it a few times all I could think was that this will change how we interact with our cities. Step on and give a kick-push and it’s just like a regular longboard. But throttle up on the wireless remote control, and a quiet 2000 watt electric motor engages, and your speed gradually increases toward its top speed of 20mph. At $1200, YC-backed Boosted Boards don’t make toys. And that’s a good thing. These are serious, eco-friendly transportation devices that could replace your bike, scooter, or maybe even your car. But that doesn’t make them any less fun to ride. 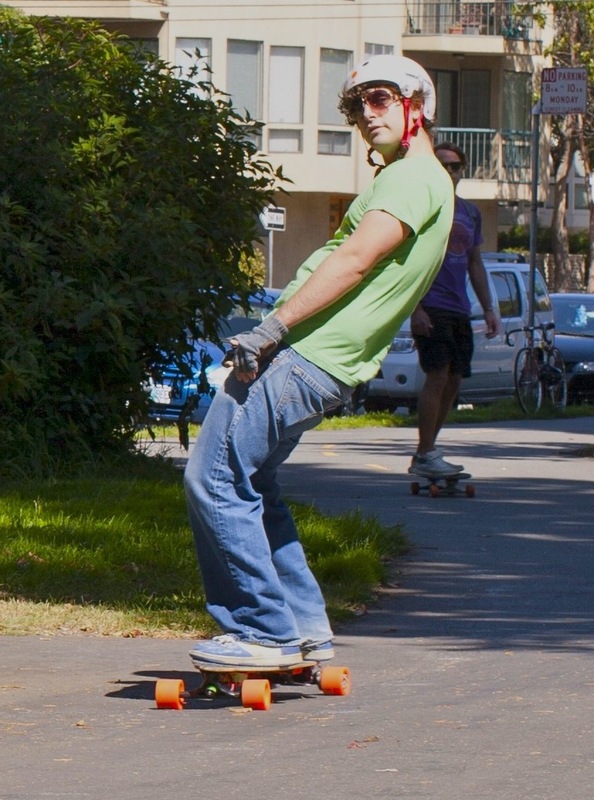 I’ve been longboarding for 9 years, most of which I spent cruising the supple curves of Stanford’s campus. But when I moved to San Francisco, the omnipresent hills limited me to riding shorter distances in flatter districts. Trying to pedal a traditional skateboard up a serious incline is exhausting and nearly fruitless. You might as well walk. That’s why I was so excited by the prospect of a great electric skateboard. But others I’ve seen or tried are so heavy they’re tough to carry when you’re not riding, employ noisy gas motors, or they’re controlled by pressing on footpads on the board itself that put you off-balance. Boosted solved all these problems. It’s boards are just 12-15 pounds, only twice as heavy as the lightweight, top-of-the-line 7 pound Loaded boards they build their electric motors into. The company says its the t electric vehicle in the world. And the handheld wireless remote lets you position your feet however’s most comfortable. An added bonus: the remote is so covert and the motor so quiet that you’ll draw dumb-founded stares from people clueless to how you’re cruising uphill without pushing. It also has motor-activated braking. Nothing’s scarier than getting going too fast down a hill on a skateboard. Typically the only options are a panicky foot stomping in an attempt to decelerate , jumping off and seeing your board fly off into the distance, or riding it to certain doom. Boosted lets you gradually reverse torque to slow down or even stop while facing down hill. This will save bones if Boosted can make you feel like you’re in total control. There’s still a few kinks to work out, which is why the first Boosted Boards won’t ship until early next summer. Specifically, it’s still a teensy bit jerky when accelerating from a dead-stop. The slightly sudden acceleration if you throttle up too fast could force you to step off or worse, fall, off the back. There’s also a small amount of vibration from the motor beneath your back foot that could tire you out a bit over long journeys. The lithium-ion battery does only get six miles on a full two-hour charge from a standard wall outlet, but braking recharges it. The team of Stanford engineering masters and PhD students assures me they’re focused on perfecting the custom motor controllers subtly built into the board’s underside. Hopefully the range gets extended, too. Luckily they’ve got help. 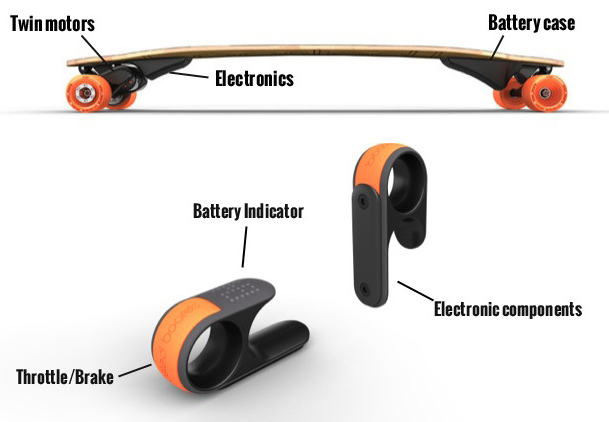 Boosted Boards is actually one of the unannounced Y Combinator Summer 2012 companies and is also in Stanford’s accelerator StartX. When I rode two of the Boosted Boards prototypes, I didn’t want to give them back. The best part about longboarding is the gentle breathing motion of carving back and forth across a city street like it was a snowboard on a mountain. It feels less like a bicycling a perfectly efficient straight line, and more like painting graceful arcs on a civic canvas. But having to push on flat land interrupts this and there’s no way to carve uphill. Until now. By combining technology with grace, Boosted Boards has made skateboarding practical, and unlocked a new way to experience the urban landscape. You can check out video of Boosted Boards in action at the company’s Kickstarter, and donate to get one as soon as they’re available.